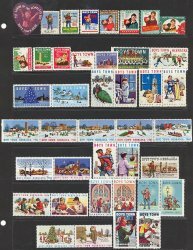 1936-71 Boys Town Christmas Charity Seal Collection, As Required, 1936 (1st issue), 1949 (2nd issue) thru 1971, full gum, F, MNH. This basic seal collection contains 41 different seals, which were issued at Christmas from 1936, 1949 to 1971, by Boys Town, Nebraska. 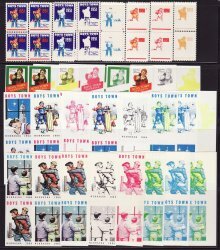 1936-71 Boys Town Christmas Charity Seal Collection, As Required, 1936 (1st issue), 1949 (2nd issue) thru 1971, full gum, F, MNH. This basic seal collection contains 41 different seals, which were issued at Christmas from 1936, 1949 to 1971, by Boys Town, Nebraska. Scan is an example of the contents of the collection.